Doughnuts are typically considered an indulgent treat, but believe it or not they can be made relatively guilt-free. These doughnuts are completely free of added fat but have a moist, springy texture like a cross between cake doughnuts and traditional fried doughnuts. The chocolate glaze uses a surprising ingredient--maple syrup--to achieve a wonderfully thick and shiny finish without butter. Both doughnuts and glaze are vegan, so they're safe for those avoiding animal products, and together clock in at around just 1 gram of naturally-occurring fat per doughnut! 1. Preheat the oven to 350 degrees Fahrenheit. Use a small piece of baking parchment paper and 1/4 teaspoon olive oil or other vegetable oil to lightly grease a nonstick standard doughnut pan that makes six doughnuts--you can skip this step if you prefer not to add any oil, but it will make the doughnuts release a little more easily and adds a negligible amount of fat. 2. In a medium mixing bowl, stir together the flour, sugar, baking powder, and salt. 4. 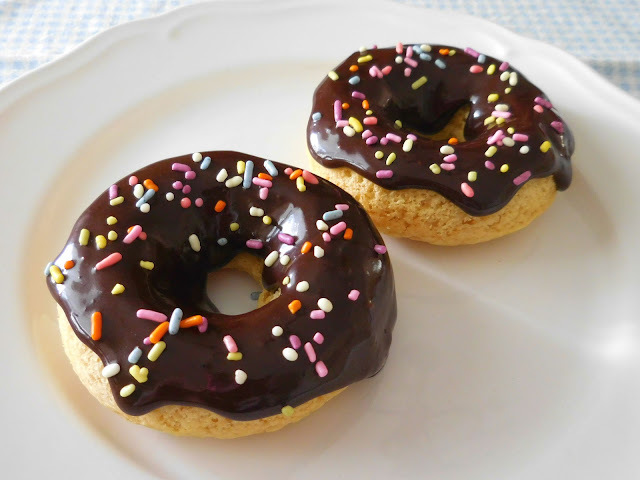 Use a teaspoon or a dessert spoon to fill the doughnut pan with the batter, carefully spooning around each ring. Lightly tap the pan on the counter to level out the batter, and use a damp paper towel to wipe any drips on the pan. 5. Bake the doughnuts until they are springy and lightly golden, about 20 minutes. 6. Place the doughnut pan on a wire cooling rack and let cool for 5 minutes. Use a dessert fork to gently loosen the doughnuts from the sides of the pan, being careful not to scratch the nonstick finish. Pop the doughnuts out of the pan with the fork, and let them cool completely on the wire rack before glazing or sprinkling with powdered sugar. 1. In a small mixing bowl, sift together the cocoa powder and powdered sugar. 2. Add the maple syrup and vanilla extract to the dry mixture and stir until the glaze is smooth and shiny. 3. Spoon and gently spread the glaze over each doughnut, allowing it to drip down the sides.